As nursery owners in Bucks County, Pennsylvania, Walt and Joan Flowers had long dreamed of combining their love of wine with their passion for agriculture. In 1989, after many information-gathering trips to Napa and Sonoma, Walt and Joan purchased 321 acres high above the Pacific Ocean on the northern Sonoma Coast. With the same determination they drew on to build their successful nursery business, the Flowers went on to produce their favourite cool-climate varietals in a place they believed uniquely suited to growing them. The rugged property, situated less than two miles from the Pacific Ocean, included a ridge top, at elevation ranging from 1150 to 1400 feet. Expecting the same foggy weather they had experienced along the coast, the Flowers were excited to discover abundant sunshine on the ridge. However, the overall temperature was still relatively cool due to the property’s proximity to the ocean, the cool morning fog below 1000 feet and the afternoon sea breezes coming over the ridge. It did not take Walt and Joan long to see that they were standing on a “warm site in a cool climate,” the ideal growing conditions for Chardonnay and Pinot Noir. They planted 23 acres on thesite, long known as Camp Meeting Ridge. Just when the Flowers thought their vineyard and winery were complete, a neighbour presented them with an opportunity to purchase an additional 327 acres. Like Camp Meeting Ridge, the rugged property was less than four kilometers from the Pacific, but had two ridges at elevation ranging from 1400 to 1875 feet. Flowers Ranch, as everyone soon called the property, was also a warm site in a cool climate. Forty-seven acres of Pinot Noir vines were planted from 1998 to 2001. 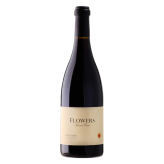 In 2004, two distinct vineyards were recognized as part of Flowers Ranch, the 25 acre Frances Thompson Vineyard and the 22 acre Sea View Ridge Vineyard. The geographical area in which it is located represents less than 1% of the Sonoma Coast AVA. The immeasurable quality of this tiny region’s fruit, however, far exceeds its size. During the growing season, the abundance of sunshine on the ridge tops is moderated by the fog and cooler temperatures of the valleys and coastline below. These conditions create a long growing season that produces wines with deep colour, ripe flavours, fine tannins and crisp acidity. 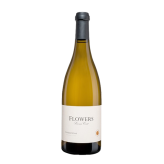 Today, Flowers Winery produces 15,000 cases of Chardonnay and Pinot Noir from its two estate properties, Camp Meeting Ridge and Flowers Ranch, as well as select vineyards in the coolest regions of the Sonoma Coast AVA, farmed to Flowers’ specifications by their own crews.